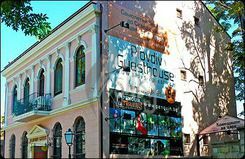 The Lonely Planet listed the Old Plovdiv guests house in Plovdiv among in the best value accommodation guide. The guide described the hostel as a beautifully restored boutique hostel is right in the heart of Plovdiv�s colourful and cobblestoned Old Town. Private and dorm rooms are all bedecked with hand-picked antiques, and lovingly painted in pastel shades from orange to sky blue. Whether you�re savouring a leisurely breakfast in the sun-dappled courtyard or snuggling down in an antique bed, the Old Plovdiv Guesthouse oozes old-world charm. The entire property is a labour of love for the owner Hristo Giulev and his wife, who rescued it from dilapidation. Today it�s unrecognisable, easily as lovely as the folk museums sprinkled around Plovdiv�s Old Town. And the entire staff welcome guests like family. �Within ten minutes of arriving, I was sitting with hot tea and a basket of fish, shooting the breeze with the owner who immediately hooked me up with travellers heading the same way as me. The welcome I received at this guesthouse is a large factor in why I fell head over heels with this spirited city.� - Anita Isalska.